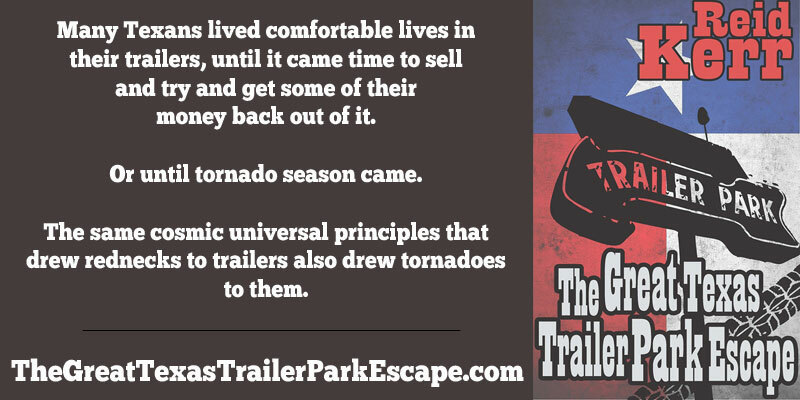 Big news from my house, my first book, “The Great Texas Trailer Park Escape” is out now from Biting Dog Press. You can find the book here, with links to buy it on Amazon and Barnes and Noble. It’s a dream come true for me, and hopefully the first of many. Hope you guys enjoy it. If you’re a reader of this blog (or my FB or Twitter), thank you so much for encouraging my behavior all these years. Check it out. This entry was posted on Tuesday, January 14th, 2014 at 4:32 pm	and is filed under Musings. The entry is tagged under humor, reid ker, sarcasm, southern humor, Texas. You can follow any responses to this entry through the RSS 2.0 feed. You can skip to the end and leave a response. Pinging is currently not allowed.